HOUSTON – The Texas Supreme Court has become the first state high court to recognize that communications between non-lawyer patent agents and inventor clients are protected by attorney-client privilege. The Texas court found that inventor Andrew Silver, represented by Ahmad, Zavitsanos, Anaipakos, Alavi & Mensing P.C., or AZA, would not have to reveal emails between him and his patent agent if they were communicating about the prosecution of the patent. Patent agents are often used by small, independent inventors because they are a more affordable way to obtain a patent. The United States Patent and Trademark Office and all federal jurisdictions recognize registered patent agents as authorized practitioners of law when they represent clients before the USPTO. The Texas court on Feb. 23 recognized that, in that situation, agents are “lawyers” for the purposes of the state attorney-client privilege. The case will now go back to the trial judge in Dallas where Mr. Silver sued Tabletop Media LLC over the patented technology for the Ziosk food-ordering tablet service used in restaurants. “This is an exciting victory because it has the potential to influence state court cases across the country,” said Jane Langdell Robinson, Of Counsel at AZA, who argued the appeal for Mr. Silver. The national legal news service Law360 named AZA a “Legal Lion” for the win in Law360’s Weekly Verdict: Legal Lions & Lambs. “Twenty-four other states—including California, Delaware, and Florida—have the same privilege rule Texas does. We believe that other states will look to this Texas ruling when patent agents and their clients assert attorney-client privilege,” she said. This case was covered in the Law360 story “Patent Agent Emails Merit Privilege, Texas Justices Say” (subscription required), in the Texas Lawbook story “SCOTX: Lawyer-Client Privilege Applies to Patent Agents” (subscription required) and in the Managing Intellectual Property story “Texas patent-agent privilege ruling could have wider impact” (subscription required). Other AZA attorneys working on the case are Demetrios Anaipakos, Tim Shelby, Edward Goolsby, and Ifti Ahmed. 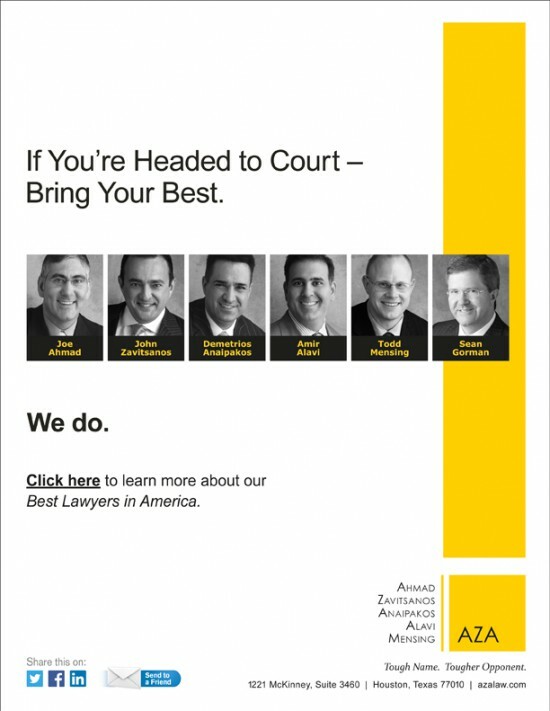 Ahmad, Zavitsanos, Anaipakos, Alavi & Mensing P.C., or AZA, is a Houston-based law firm that is home to true courtroom lawyers with a formidable track record in complex commercial litigation, including energy, intellectual property, and business dispute cases. AZA is recognized by Chambers USA 2017 among the best in Texas commercial law; by U.S. News – Best Lawyers’Best Law Firms as one of the country’s best commercial litigation firms for 2018; and previously by Law360 as a Texas Powerhouse law firm. National corporate counsel named AZA one of the country’s best in client service among law firms serving the Fortune 1000. Visit https://azalaw.com.